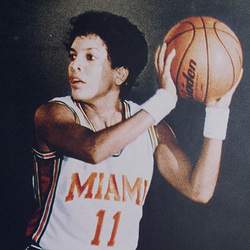 Maria Rivera has held Hurricane records in six categories; career points (2,358), career field goals made (891), career field goals attempted (1,931), career free throws made (508), career free throws attempted (651) career steals (382). Maria was named honorable mention All American her senior season. She entered the game on February 11, 1988 vs. Central Florida needing 29 points to break Rick Barry's school record of 2,298 career points, she scored 30 points in the first half on her way to a school record 41 point performance. She still holds the U.M. single-season record in steals with 106, set in 1986-1987, and is was the first women's basketball player to have her number, No. 11, retired.